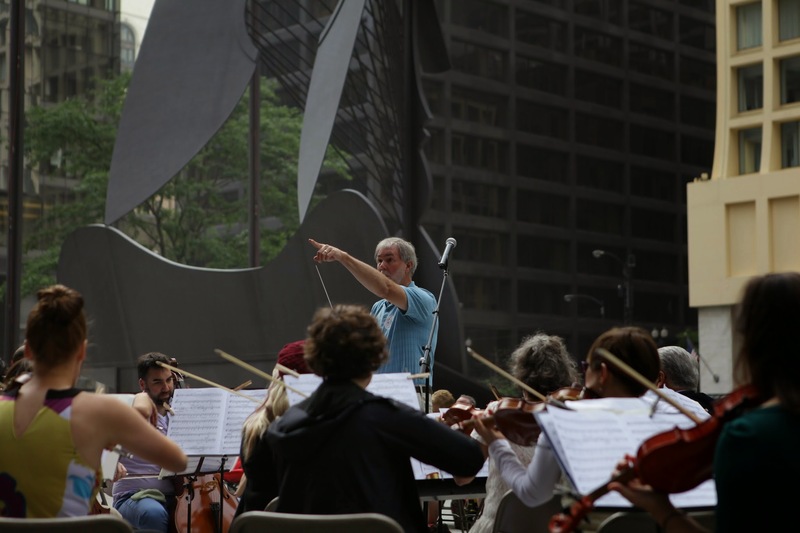 Presented by Rush Hour Concerts, Make Music Chicago, a completely free musical celebration across Chicago, returns for its fifth annual event on the first day of summer and longest day of the year, Sunday, June 21, which is also Father’s Day! Chicago joins more than 700 cities across the world celebrating free music as part of the international music holiday, Fête de la Musique, annually held on the Summer Solstice. This year, Make Music Chicago is presented as part of the Chicago Park District’s Night Out in the Parks and other Chicago cultural partners with the support of Mayor Rahm Emanuel. Make Music Chicago celebrates the ability of everyone to participate in music-making. Throughout the day, music-makers of all ages, abilities and musical tastes– amateurs and professionals alike – gather in Chicago’s public spaces to play and sing live music of all genres. Under the helm of Artistic Director and lauded pianist Kuang-Hao Huang, with the support from Executive Director Kitty Rothschild, Make Music Chicago will feature 200 performances and participatory events across 80 locations in over 20 Chicago neighborhoods from sunrise to sunset with performances at Millennium Park’s Wrigley Square, Old Town School of Folk Music, Lincoln Park Zoo, Chicago Cultural Center’s Preston Bradley Hall, Museum of Contemporary Art, the recently opened 606 Bloomingdale Trail and Chicago Riverwalk plus over 30 Chicago Park District sites, including the new Maggie Daley Park. A complete list of performance sites can be found at http://makemusicchicago.org/. In support of the Chicago Cultural Plan, Make Music Chicago has increased its performance locations and is proud to present live programming and participatory events at Chicago’s noted landmarks, physical assets and newly developed public spaces including Maggie Daley Park, Millennium Park – Wrigley Square, and the brand new Chicago Riverwalk along the main branch of the Chicago River to help raise these cultural platforms and highlight the importance of accessibility to music and music making. Make Music Chicago presents its first Smartphone Sing-A-Long in celebration of the Father’s Day holiday. Beginning at 4:00 pm, Chicagoans are invited to synch up to a traveling choir via a specialized Smartphone app titled Susync and sing-along with vocalists from Chicago’s OperaModa at assigned starting points around the city, singing as they move towards the culminating choral performance at Maggie Daley Park’s Lawn Valley South at approximately 4:45 pm. Award-winning Chicago composer Mischa Zupko has been commissioned to create a six-minute, eight-part choral piece titled Call Your Dad, which can be downloaded in advance in addition to sheet music, practice tracks and the app itself via the Make Music Chicago Facebook page in June. David Eccles from the Vandercook College of Music leads musicians through vibrant orchestral music with the return of this Make Music Chicago favorite at a new location, Wrigley Square. All ages and abilities are welcome to bring their own instrument and play along with members of the Chicago Symphony Orchestra. Rich Fischer, Director of Bands at Concordia University-Chicago, leads band instrumentalists through a play-along of John Philip Sousa’s classic marches featuring the 24-member Ceremonial Band of the U.S. Navy Band Great Lakes. All former and current band members are invited to come play along! Newberry Library Sing-Along invites families to sing and play-along to selections from the library’s early 20th century American sheet music collection including Yankee Doodle,Oh! Susanna, Camptown Races, Maple Leaf Rag and other favorites and instrumental interludes with an Ode to Joy grand finale just before 4:00 pm. Make Music Chicago includes multiple Family Concerts throughout the day, including at Lincoln Park Zoo (2001 N. Clark Street), Old Town School of Folk Music in Lincoln Square (4544 N. Lincoln Avenue), The Comfort Station in Logan Square (2579 N. Milwaukee Avenue), Loyola Park in Rogers Park (6900 North Farwell Avenue), Maggie Daley Park’s Play Garden (337 E. Randolph Street) and The Welles Park Gazebo (2333 W. Sunnyside Avenue). Woodwind ensemble Quintet Attacca perform their interactive “Peter and the Wolf” show where different characters of the story are represented by different instruments. Kids of all ages familiar with the popular Suzuki Method for Music are invited to join in playing popular tunes such as Twinkle, Twinkle Little Star and Go Tell Aunt Rhody, along with the Merit School of Music’s Suzuki program and other Chicago Suzuki programs at the Sea Lion Pool. Youth Music Showcase includes an interactive concert for families followed by an all-inclusive musical parade at The Welles Park Gazebo. An open-door experimental concert for kids with battery powered instruments. This read and sing-along for young children features story time with live music performed by The Lucky Trikes. A participatory program of songs and stories for children focused on environmental awareness, neighborhood diversity and the ability of everyone to make his or her own music. Los Jaraneros, Youth Fiddlers, and The Young Stracke All Stars all present interactive street performances in the gazebo. A rebroadcasting of the world premiere arrangement of Lewis’ compositions by Chicago native Andrew Chukerman performed by Lewis and the Highland Park High School Jazz Band. This arrangement was commissioned by Welz Kaufman, President of Ravinia, to honor Ramsey and kick-off his 80th birthday celebration. Ramsey Lewis is the Artistic Director of Jazz programming at Ravinia. In conjunction with The Plaza Project, a creative platform dedicated to transforming Chicago Plazas into public art destinations through curated artistic experiences, Make Music Chicagowill also present a series of free, live pre-event performances during the lunch hour from 12:00 – 1:00 pm at Two North Riverside Plaza located in downtown Chicago. Tsukasa Taiko Community Ensemble with Yoshinojo Fujima presents a traditional Japanese taiko drum performance. WillfromBrazil de Carvalho will present American and Brazilian song favorites in a live performance that mixes jazz-funk with traditional samba. Award winning, Chicago-based quintet Axiom Brass will present an afternoon of brass chamber music. Rush Hour Concerts Community Engagement featuring youth from the Back of the Yards neighborhood with performances from the Jazz Institute of Chicago’s Jazz Links Youth Ensemble to follow. Joe Hertler and the Rainbow Seekers give a live performance from their recent album, “Terra Incognita—” a blend of Motown, folk, and funk. Chicago Sea Shanty Sing invites everyone to join a participatory sing-along of sea shanties and maritime themed pub songs. Volca Series Boogie Play-Along invites all to bring their Korg Volca Series speaker to link up to an improvised synthesis play along. Rhythm Revolution Drum Circle, facilitated by John Yost. Youth from the Back of the Yards neighborhood will present vocal and instrumental music as part of Rush Hour Concerts’ community engagement residency program. Marisa Cordeiro and students of the Old Town School of Music present an interactive performance of Capoeira, a Brazilian dance and martial art form, accompanied by live music. Teaching Artist Harry Detry and students of the Old Town School of Folk Music demonstrate West African Dance in an interactive performance encouraging all to dance along to live drumming. A play and sing-along parade open to all brass, fiddles, guitars, drums, singers and instruments from Old Town School of Music to The Welles Park Gazebo. Rush Hour Concert presents a two-part, hour-long concert featuring singers from the Lyric Opera’s Ryan Opera Center followed by a performance of James Whitbourn’s “Luminosity” performed by Artistic Director Anthony Devroye with contemporary choral group Cor Cantiamo. Harmonica Blowout play-along led by Old Town School of Music teacher Skip Landt with free harmonicas provided by Hohner. Hawaiian Lanialoha Lee leads an island style play-along with free playbooks provided by the National Association of Music Merchants and Alfred Music Publishing. Oak Park School of Rock, Terry White, Addon Davis, The Replays, Bill Kavanaugh, Brian Mahoney. Over 200 Make Music Chicago events take place throughout the day, so for a complete and up-to-the-minute list of events, visit www.makemusicchicago.com/listings. Programming is subject to change. Celebrating the ability of everyone to make music, Make Music Chicago is completely free for musicians and audiences alike. It is inspired by Fête de la Musique, a national musical holiday in France. Since its inaugural year in 1982, Fête de la Musique has become an international phenomenon taking place every June 21. In 2014, over 700 cities took part in 130 countries worldwide – including Germany, Italy, Egypt, Syria, Morocco, Australia, Vietnam, Congo, Cameroon, Fiji, Colombia, Chile, Nepal and Japan – easily making it the largest music event in the world. Make Music Chicago is part of a national group of “Make Music” cities that includes New York, Los Angeles, Boston, Seattle and Philadelphia. Make Music Chicago is presented by Rush Hour Concerts in partnership with the Chicago Park District. Presented by Mayor Rahm Emanuel, Night Out in the Parks provides world-class performances in Chicago’s neighborhood parks throughout the summer with programming across the city to advance the goals of the Chicago Park District and the Chicago Cultural Plan. In its third year, the 2015 Night Out in the Parks series will bring more than 1,000 events and programs to neighborhood parks throughout the city, making community parks safe havens and hubs of activity. The Chicago Park District has partnered with nearly 100 arts and community organizations to expand and produce this successful initiative. Rush Hour Concerts presents the annual Summer Concert Series featuring free concerts of “great music for busy lives” at St. James Cathedral every Tuesday evening, June 2 – August 25, 2015. Rush Hour Concerts begin with a pre-concert reception and curated conversation at 5:00 pm followed by a 30-minute concert at 5:45 pm. The reception and concert are alwaysfree and no tickets are required. Since its founding in 2000 by the late Deborah Sobol, Rush Hour Concerts has reinvented the classical music experience through a dedication to artistic quality, a concert format suitable to contemporary lifestyles and a policy of admission-free events. Rush Hour Concerts has created groundbreaking programs and access initiatives that have revolutionized music-making in Chicago and forged trendsetting partnerships with the city’s arts and cultural community. Rush Hour Concerts is committed to broadening arts access and launched its Community Engagement Residencies to bring expert musical instruction to under-resourced neighborhoods in Chicago through a long-term strategy of artistic and community collaboration. Now celebrating its 16th anniversary, Rush Hour Concerts has expanded into a year-round arts organization, yet remains grounded in its mission to reach across all communities with new ways for audiences to experience world-class music in Chicago. To learn more about Make Music Chicago, please visit www.makemusicchicago.com, and to learn more about Rush Hour Concerts, please visit www.rushhour.org.